Welcome to Part 1 of our Across the Board CAL! We are so excited to see the enthusiasm that our CGOA members have brought to this event. Just a reminder that everything you need to know about the CAL in upcoming weeks can be found on this post. This segment is brought to you by Unicorn Fibre, a company who specializes in fiber cleaning and conditioning products to keep your crochet looking its best! They have graciously donated their adorable Unicorn Baby Gift Set for this segment's giveaway. It contains 4 oz each of their Fibre Wash, Power Scour, and Fiber Rinse products, all topped with a sweet baby unicorn plushy. This prize is being shipped directly from Unicorn, and is available to be shipped in the USA only. Enter the giveaway through the Rafflecopter below for your chance to win! Entries will be accepted from February 29th through March 13th, 2016, and a winner will be selected on Monday, March 14th. This segment's strip is the Diamond Trellis by Kate Steinke, the Chair of CGOA's Volunteer Committee. This strip offers a fantastic opportunity to practice color changes and "carrying" unused colors to avoid having multiple ends to weave in. It can be found on Page 3 of the Across the Board 2015 booklet. Get on Board with CGOA's Across the Board Crochet-Along! 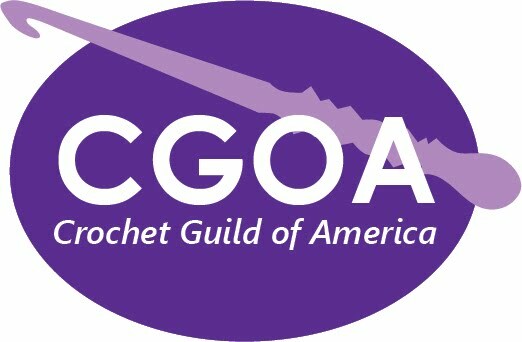 March is National Crochet Month, and the Crochet Guild of America is going to be kicking off the festivities with a very special crochet-along (CAL). Did you know that one of the many benefits of joining the Crochet Guild is free access to exclusive crochet patterns for members only? It's true! And beginning February 29th, we'll be hosting a CAL for CGOA's members-only Across the Board afghan pattern, available for download here. Note: While the pattern is free, you do have to be a CGOA member in good standing to download it. The Across the Board afghan was designed by CGOA's own board members. Red Heart graciously donated the yarn that was used to design this project. It's made up of seven different strips, each of which feature a different crochet technique. 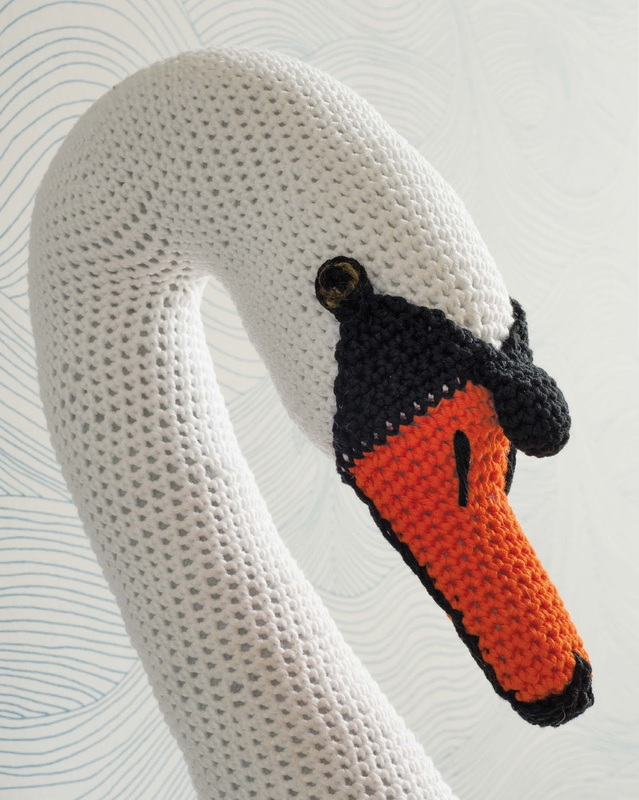 If you ever wanted to expand your crochet skills, now's the time! Some of the featured techniques you may have never seen before. Not only will you be able to post pictures of your progress on the CGOA Now! blog, we will also have a Ravelry group and Facebook group you can join to discuss your project. Join the Facebook group here and Ravelry discussion here. As mentioned above, some of the techniques used in the afghan may be brand new to you. 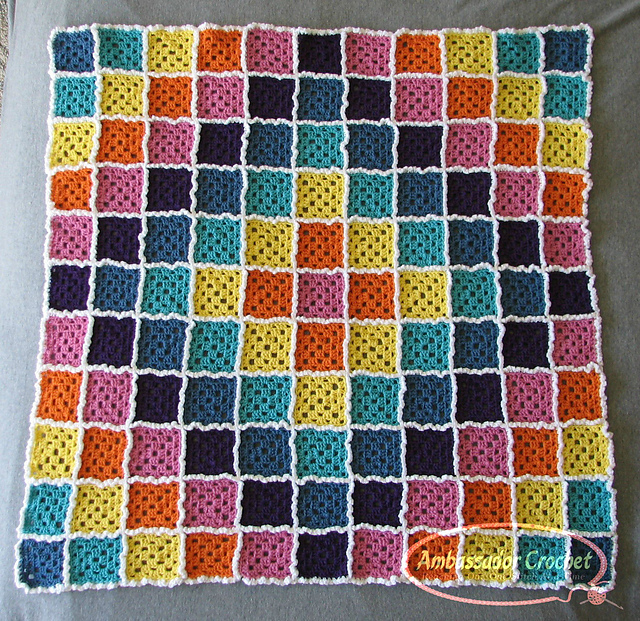 One of the advantages of making this afghan during a crochet-along is support from your fellow crocheters if you get stuck on something. Plus, who doesn't want to show off their hard work? If you'd rather not make the entire afghan, feel free to pick the strips that interest you the most and turn them into scarves. This CAL can be anything you want it to be. Note on Giveaways: As the prizes will be shipping directly from our sponsors, there may be some international shipping restrictions, depending on the sponsor. These details will be mentioned in that segment's giveaway. How do I join the CAL? I noticed this book on Amazon when it was still in pre-sales, and when I was asked to review it, I was super excited! I've never tried fair isle Tunisian crochet before, but it's been on my list of skills to learn for quite some time. Brenda's book was just right for me! Brenda starts out with a great introduction about what this technique is, how it can be used, and how she learned and fell in love with Tunisian fair isle. She then continues on with a spectacular technical section. Brenda takes the time to explain the importance of things like floats, gauge, swatching, and blocking (with plenty of pins!). Then there are 15 pages of stitch explanations with step by step photos. This makes every stitch so easy to understand and master, even if you've never tried Tunisian crochet before. Next Brenda takes the time to teach some skills, techniques, tips and trick, and to give pointers on notions needed and even color planning. By the time I got to the first pattern, I no longer had any questions about how to create Tunisian fair isle, or if I could. I had every tool I needed and was ready to go! The book continues along in an intelligent pattern order, starting with smaller and easier projects. The first 2 patterns are boot cuffs, which are quite hot right now! 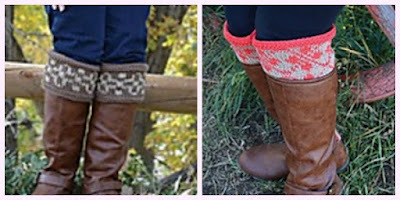 The first boot cuff pattern has a simple chart with short floats. Though it may appear as though these (and many of the other patterns) are worked in the round, all the patterns in this book are worked flat and seamed together. No worries about seaming though, Brenda explained all that in the beginning of the book. 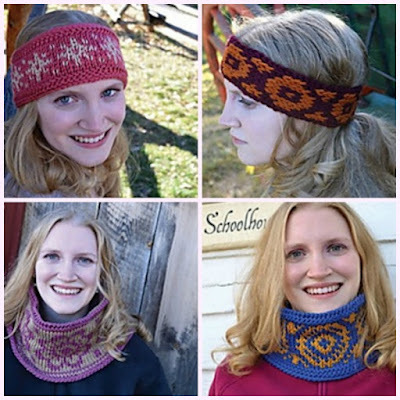 I love that there are 2 or 3 of most type of pattern in the book, such as the boot cuffs, ear warmers and neck warmers; but all with different charts. 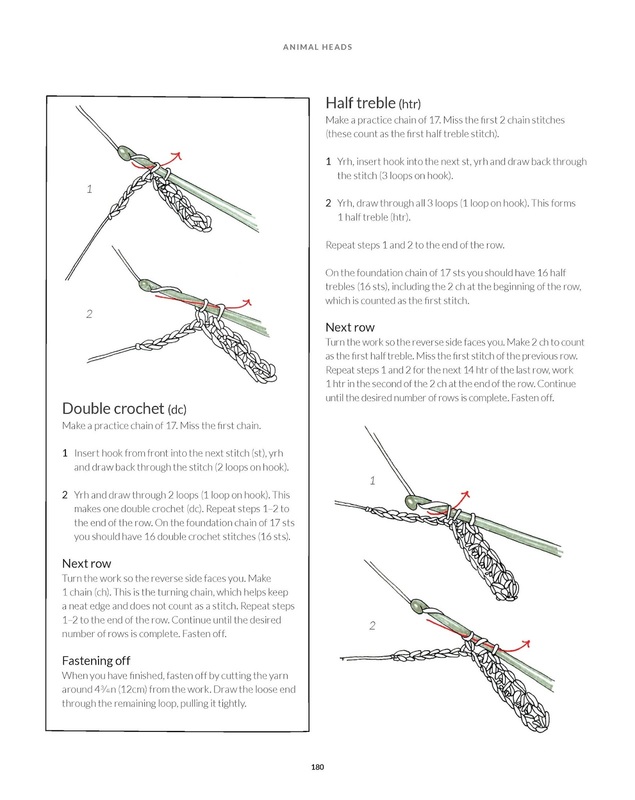 This allows the crocheter to become confident with the pattern while working on improving their fair isle technique. Though there are plenty of easier patterns, Brenda does include some patterns to help the reader grow their skills even more. 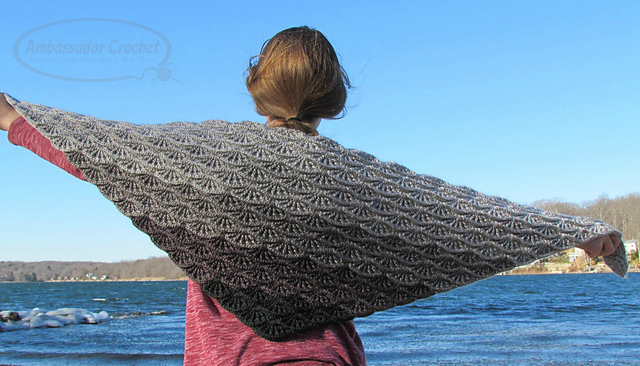 There are 2 patterns that use more than 2 colors, there are some blankets for those wanting a larger project, and there are even a couple sweaters. Fair Isle Tunisian Crochet by Brenda Bourg is a great book for those looking to expand their crocheting skills into Tunisian fair isle, and for those who already know Tunisian fair isle but want to improve those skills or find more wonderful patterns and charts to use. Fair Isle Tunisian Crochet by Brenda Bourg can be found HERE on Amazon and retails for $21.95. You can also find the Ravelry listing HERE. Now for something extra special from Brenda and Stackpole - your chance to win a FREE copy of this awesome book!! 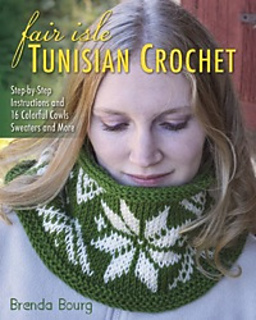 To enter the Fair Isle Tunisian Crochet book giveaway, you must be 18 years of age with a valid shipping address. Giveaway is open to USA residents only. Giveaway ends February 21st at end of day eastern time. One winner will be contacted by email for their shipping address, once the winner replies with a valid USA shipping address, the winner will be sent the book. Winner must reply to notification email with a valid shipping address within 1 week or a new winner will be chosen. Full disclosure: A free electronic review copy of Fair Isle Tunisian Crochet was provided by Stackpole. Although I accept free products for review, I do not accept additional compensation, nor do I guarantee a positive review. My reviews are based entirely on my honest opinions. I'm Marie Segares from Underground Crafter and this is the second post in a monthly series for CGOA Now! where I shine a spotlight on a CGOA member and share a bit of her story with an interview. 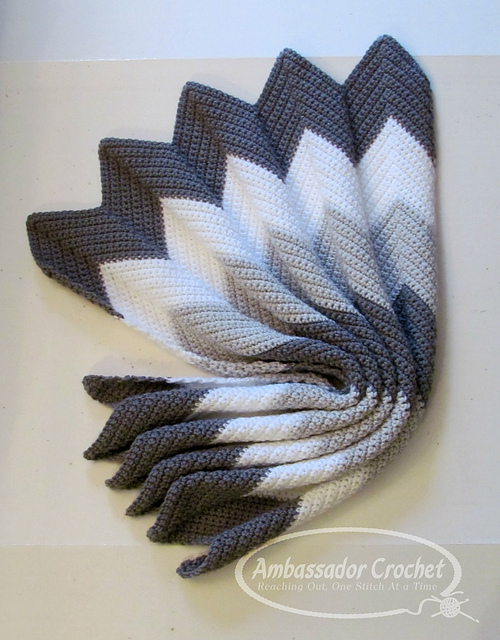 In this month's post, I'm talking with Kristine Mullen from Ambassador Crochet. Kristine is a crochet designer and tech editor, and she can be found online on Facebook, Instagram, Pinterest, Ravelry, and Twitter, as well as in her pattern shop. All images are used with permission and are © Kristine Mullen/Ambassador Crochet. 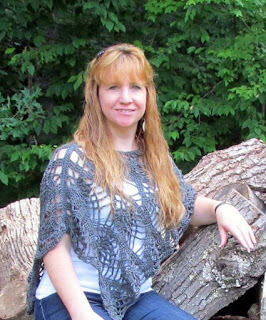 Kristine Mullen (KM): My mother taught me to crochet when I was 5, but I didn't pick it up again until I was in my 20's and pregnant with my first daughter. 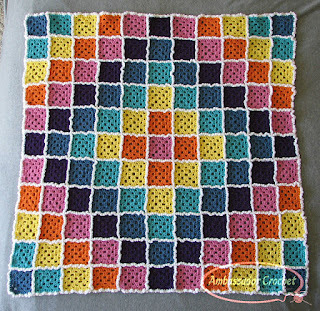 Candy Cloud Burst Baby Afghan, crochet pattern by Kristine Mullen. KM: I started designing in 2007. A friend of mine had a preemie (30 weeks gestation) and I wanted to make him a blanket. I couldn't find anything I liked so I decided to make my own. It was at that point I realized I loved designing my own patterns. Hat for Hope, crochet pattern by Kristine Mullen. KM: I have been a member of the CGOA since 2013. My favorite part is the networking. I feel like everyone has been very willing to help, promote, and encourage each other because we're all in this together. 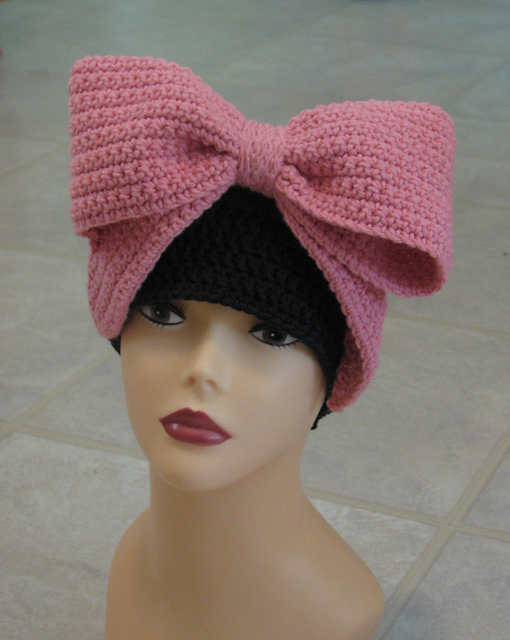 The Royal Bow Beanie, crochet pattern by Kristine Mullen. UC: You're also a tech editor. Can you tell us what you do as a tech editor, and how you got started? KM: A tech editor checks a pattern for errors. It can be everything from math errors, to formatting or style issues. For me it all started when I was a tester for a designer. She started noticing that I was picking up on errors beyond what a tester would normally find and asked if I had ever thought about editing. It has since become a passion of mine. 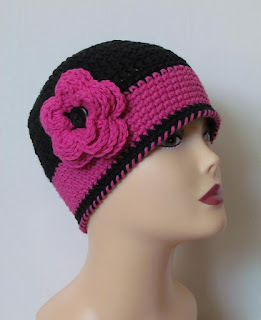 Super Bulky Winter Hat, crochet pattern by Kristine Mullen. UC: Has tech editing influenced your design work at all? If so, how? KM: It has definitely helped me branch out beyond hats and baby blankets, but I don't think it has necessarily influenced my designs. It has definitely influenced my writing style though. Now I try really hard to write a pattern that can be read by any level crocheter so that even if the stitch work is difficult the pattern won't be hard to understand. Indigo Falls Infinity Scarf, crochet pattern by Kristine Mullen. 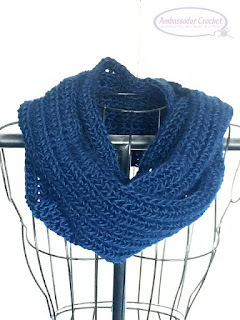 KM: I love working up infinity scarves and cowls. Gray Skies Gradient Shawl, crochet pattern by Kristine Mullen, and winner of the Fan's Choice Award for Battle of the Stitches Round 8. KM: That's a good question. I love to try experienced or challenging patterns, but I don't know that I have a specific project type. I think I lean more towards stitch combos and overall design. I guess if I had to pick a project type I would pick shawls or sweaters. Waves of Grayce Chevron Baby Blanket, crochet pattern by Kristine Mullen. KM: I love making baby blankets and scarves to give as gifts. 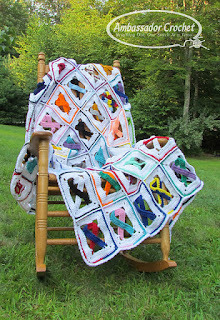 Awareness Ribbon Afghan Project, crochet pattern by Kristine Mullen. KM: I'm spending more time tech editing and I want to put myself out there and submit more designs for publication. I also want to help people advance their crocheting skills. Thanks so much, Kristine, for sharing your love of crochet with us. Once in a while you come across something truly unique and different...and you're not quite sure what to think of it. That was this book for me when I first saw it. Looking through the book though, I quickly fell in love with these designs. 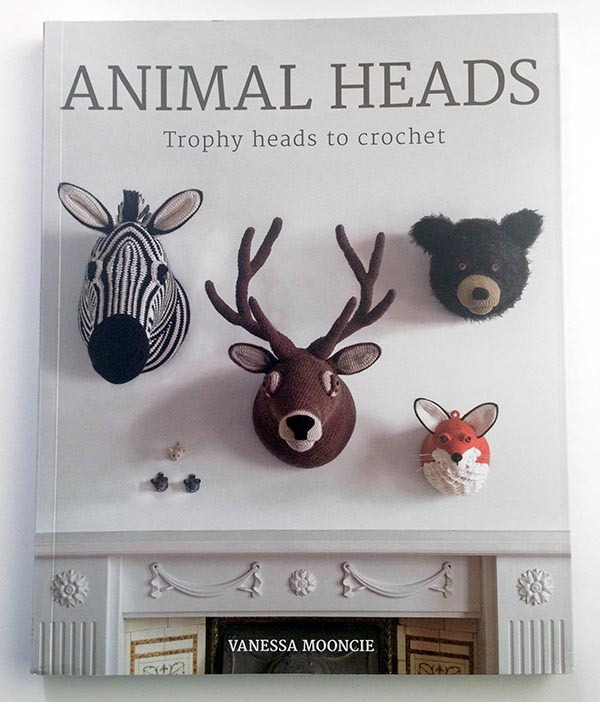 The book contains patterns for 10 different animal heads: Mouse, hare, fox, ram, swan, lion, stag, bull, black bear, and zebra. 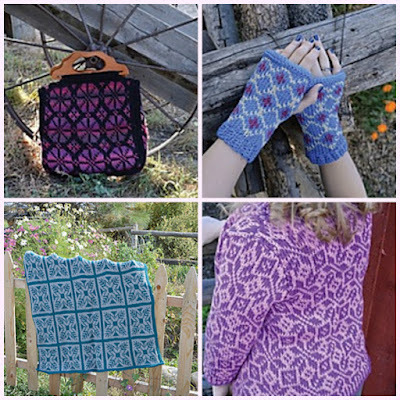 Each pattern has great attention to detail, and a variety of yarns and materials are recommended to create the different textures. The overall effect is very realistic! The patterns do vary in difficulty, however each starts with a clear and detailed summary of how the piece is constructed, so you know what you'll be getting into before you start. I particularly love that each pattern includes charts in addition to the written instructions. I find charts easier to follow, but as both are provided you can choose your favorite, or refer to both. It should be noted that this book is published in the UK and uses UK terminology. This differs from US terminology in some important ways. 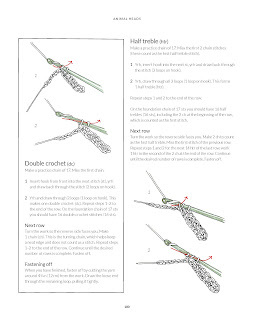 For example what we call a single crochet is what they call a double crochet, and what we call a double is their treble. Here's a conversion chart that shows some of the differences. The book contains detailed photo tutorials for each stitch and technique used though, so there's no need for confusion! Faux taxidermy has never really been part of my decor choices, but these lifelike, well written patterns are quite tempting. I can imagine they would be really cute in a child's room, and would fit well with a Noah's ark, jungle, or other animal based theme. As a side note, this book has left me with a naughty little desire to make one of the mouse heads and attach it in a corner so it's peeking out from under the sofa - just to see if anyone notices! 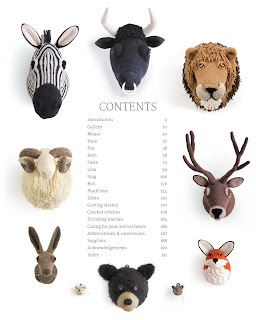 Disclaimer: A free review copy of Animal Heads was provided by GMC Publications. Although I accept free products for review, I do not accept additional compensation, nor do I guarantee a positive review. My reviews are based entirely on my honest opinions. All images of interior pages were supplied by the publisher and are used with permission. Hey! 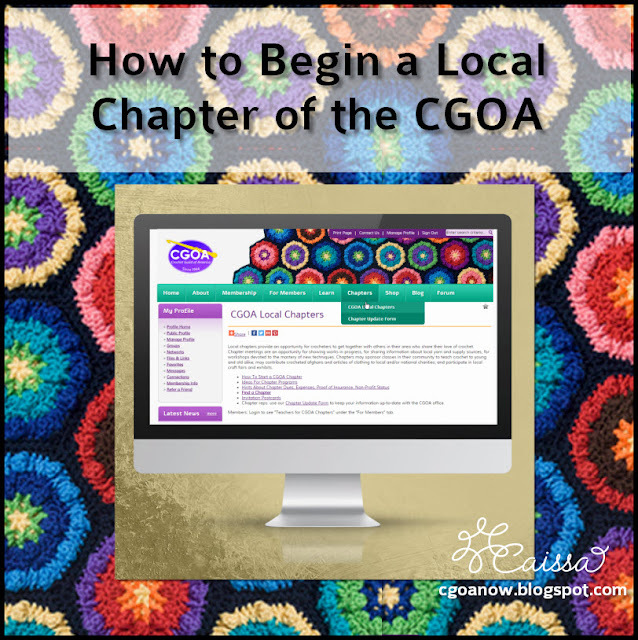 Do you want to be a part of your local Crochet Guild of America chapter? When I joined CGOA, I know that I did, but unfortunately there was no chapter anywhere near me. (Believe me, I searched!) To top it off, I was living in Mexico! I became active in the Cyber Crochet of CGOA Chapter on Ravelry, but I still wanted more. I had been meeting with my local stitch group, but we still wanted to be part of something bigger! I had been toying with the idea starting a local chapter of the CGOA in Mexico City, and with the support of my stitch group and my friends from the cyber chapter, we made the dream a reality. At least one active CGOA member. Yes, that's it. The other members of your group don't have to be members of the CGOA, but the more the merrier! To fill out some paperwork (just 3 pages). The paperwork you need to fill out is the APPLICATION FOR STARTING A CGOA CHAPTER In this form, you will have to share basic information, including the proposed Chapter Name (get creative & have fun! ), The President's name (this will be YOU if you are the only CGOA member), and general information about the chapter and the president's contact information. Forty bucks. Payment is easy, because it can be made online. It's a group contribution. No one owns the chapter. As a chapter president, I can tell you that I have had people contact me because of the CGOA chapter listing. It's a great way to network for crochet and get your group's name out there! A list of members. CGOA asks for a list of members and officer titles. The Web Form. If you do not want your personal information shared on the public end of the CGOA website, fill out Information for the CGOA Web Site Posting of Member Chapters. This is how the public will find you and contact you for crochet opportunities! So that's the paperwork you need to fill out to create your chapter. For even more information, check out the resource page on crochet.org. To be honest, it was a lot easier than I thought it would be. Once the application is received, it is reviewed by the CGOA and you will receive notification of your status in a timely manner. So now that you have your group, you can meet as a CGOA Chapter! Yay! My chapter's first event as "Ganchitos" was a yarn bombing in a local park. It was beautiful and inspiring! Ganchitos meets regularly and does whatever kind of event the members care about. It's not terribly formal, but your chapter CAN be! The beauty of the CGOA is that it leaves room for your group's personality to shine. If you're formal - be formal! Here is a list of ideas for chapter programs. I am very much in favor of getting more local chapters going, so let's keep talking. Are you active in your local CGOA Chapter? Have you ever thought of starting a chapter? What do you think would be great ideas for chapter programs? Please leave a comment here on the blog, and let's connect on social media! I can be found on facebook, twitter, Pinterest, Instagram, Tumblr, Google+, and YouTube. Join my monthly newsletter about crafts, crochet, and education. Get those hooks up!